Let me begin by playing a tape for you. What you�re about to hear is a conversation that my government monitored. It takes place on November 26th of last year, on the day before United Nations teams resumed inspections in Iraq. The conversation involves two senior officers, a colonel and a brigadier general from Iraq's elite military unit, the Republican Guard. For example, let me focus on the now famous declaration that Iraq submitted to this Council on December 7th. Iraq never had any intention of complying with this Council's mandate. 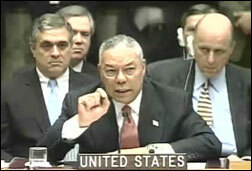 Instead, Iraq planned to use the declaration to overwhelm us and to overwhelm the inspectors with useless information about Iraq's permitted weapons so that we would not have time to pursue Iraq's prohibited weapons. Iraq's goal was to give us in this room, to give those of us on this Council, the false impression that the inspection process was working. Not only is this test well in excess of the 150 kilometers that the United Nations permits, the test was left out of Iraq�s December 7th declaration. The UAV was flown around and around and around in this circle and so that its 80-kilometer limit really was 500 kilometers, unrefueled and on autopilot -- violative of all of its obligations under 1441.